At some point in our lives, most of us have engaged in an activity for which we were required to sign a release of liability. If we have children, we have certainly had to sign participation forms for our children before they are allowed to go on field trips or participate in any number of activities, including sporting events. In Duhon v. Activelaf, LLC, participants at defendant’s indoor trampoline park were required to sign a participation agreement prior to using any of the equipment in the facility. 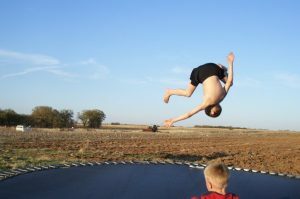 While many people are familiar with trampolines and have likely been on one at some point in their lives, they may not realized they can actually be quite dangerous. Many people suffer serious head and neck injuries on them that can result in permanent paralysis or even death. In this case, plaintiff went to the trampoline park with three minors under his care. When the participants are minors, the adult guardian is required to sign the participation form. Plaintiff was required to complete a liability form on a computer screen for all of the children. He was required to acknowledge that using their equipment is inherently dangerous and could not be made safe while still keeping it as an enjoyable activity, and he was accepting responsibility for the payment of any needed medical care. He was also required to confirm that he agreed to release defendant from any and all liability in connection with any injuries while his children were at this facility, and he was required to certify that his children were physically able to participate in this activity. The waiver also asked plaintiff to admit that he was the legal guardian for these children and agree to a number of other conditions. He then filled out the same information with regard to himself. While using the facility, he was personally injured and eventually filed a lawsuit against the defendant to cover the total loss he suffered as result of his injuries while using the defendant’s equipment. When he filed the lawsuit, the defendant claimed that this liability waiver contained a mandatory arbitration provision. Plaintiff responded to this motion to dismiss by arguing that the alleged arbitration clause was adhesionary and ambiguous. As our Boston personal injury attorneys can explain, an adhesionary contract or agreement is one that is not a bargained for exchange. In a normal contract, both parties are supposed to make promises so that each one gets a benefit and incurs a detriment. A detriment is not something bad in this context, but rather something you were not legally required to do. If you agree to buy someone’s car for $4,000, you getting the car is a benefit, and paying the money is a detriment. The seller’s detriment is giving up the car, and his or her benefit is collecting the money. An adhesionary contract is a “take-it-or-leave-it” contract in which the person agreeing gets no benefit. In this case, he had already paid, and the center agreed to grant to him access, and this was before being required to sign the waiver. The court agreed with defendant, but, on appeal, the state supreme court held that this contract was adhesionary and reversed and remanded the case for further proceedings consistent with its opinion. In a companion case, one of the minors was also injured, and court reached the same result.